Reality TV you would die for. 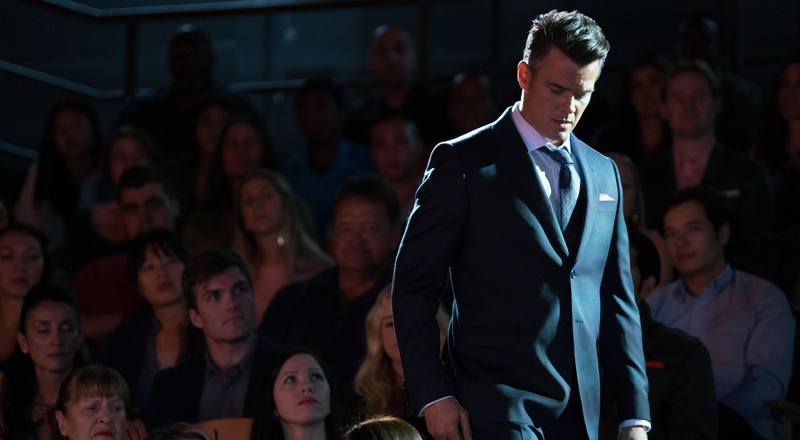 Adam Rogers (Josh Duhamel) is a reality TV host for a show called Marrying a Millionaire. When the contestant that loses gets angry, she shoots the man she was supposed to marry, then turns the gun on herself. Rogers, in the aftermath goes on a rant about how reality TV effects people on national television. His producer Ilana (Famke Janssen) sees an opportunity, and crafts a show called This Is Your Death, with contestants offing themselves for a purpose. Something Rogers initially struggles with, but then goes along because he believes he's helping. Not everyone thinks this is a good idea. Mainly his sister, Karina (Sarah Wayne Callies) In a side story, we also follow down on his luck family man Mason (Giancarlo Esposito) who loses his job and is so far in debt that he's running out of options. This hit the festival circuit earlier this year under the title This Is Your Death. A wise name change helps. No one will mistake it for a B horror movie now. Giancarlo Esposito also directs and produces. I found the production and dialogue to be very basic. There's nothing terribly clever here, but in terms of story I could not take my eyes off it. I'm not going to get on my high horse and talk about how obsessed today's world is with reality TV. I'm guilty of watching some of it myself but The Show has some very interesting commentary on it without coming off as overly preachy. Giancarlo is wonderful in this film. So much so that I actually cried during one point. Duhamel makes a good host. He's not a very strong actor at all, but when he's not doing an emotional scene he works very well. I can forgive a few cringeworthy plot points and set ups for a film that is this enthralling. I wasn't expecting to feel anything while watching this, yet there I was, rooting for some characters and being appalled by others. No, it's not a horror movie but I can see how the original title would mistake it for one, so I think that's why they changed it. Giancarlo Esposito directs? Live him as an actor so this has me intrigued. Personally, I try not to watch reality TV, but it's impossible to escape. I've resigned myself to not watching the uber trashy Housewives/Bachelor/Dance Mom type. Same, I never watch those. For reality TV the only thing I really watch consistently is Chopped on the Food Network. I'm aware of a lot of shows, but that's it for me.